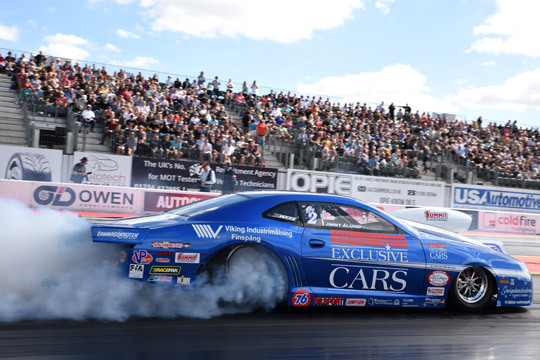 The outcome of the FIA European Drag Racing Championship couldn’t have been more exciting as three of the titles were decided in the penultimate runs of the season, the semi-finals of the European Finals at Santa Pod, the sixth and final round of the FIA European Drag Racing Championship. 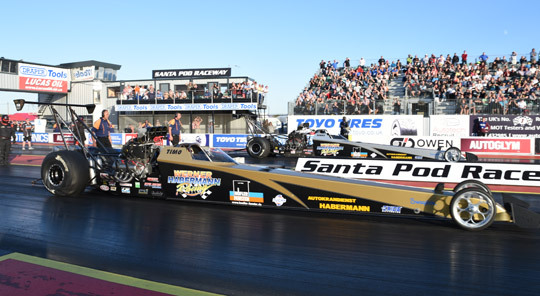 In Top Fuel championship leader Anita Mäkelä lost her semi-final, but as runner-up Stig Neergaard was also defeated in the same round, the FIA European Top Fuel title was for Mäkelä. The race at Santa Pod was won by 2015 champion Michael Kågered. 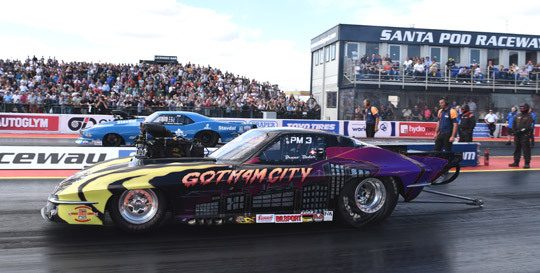 In Pro Modified championship leader Michael Gullqvist defeated his only remaining rival Bruno Bader in the semi-finals, clinched the title and also won the race at Santa Pod. 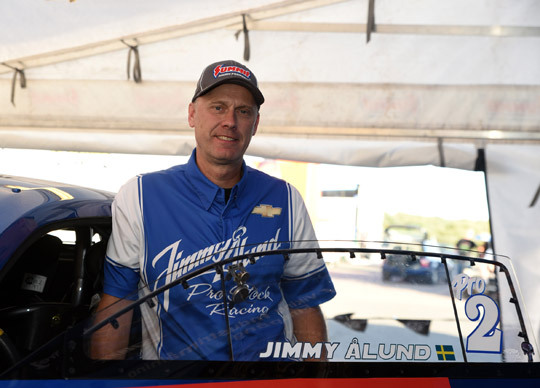 In Pro Stock Jimmy Ålund defeated Stefan Ernryd in the semi-final and that win was enough to secure his tenth FIA European Pro Stock title. The champion was defeated in the final by Bengt Ljungdahl. 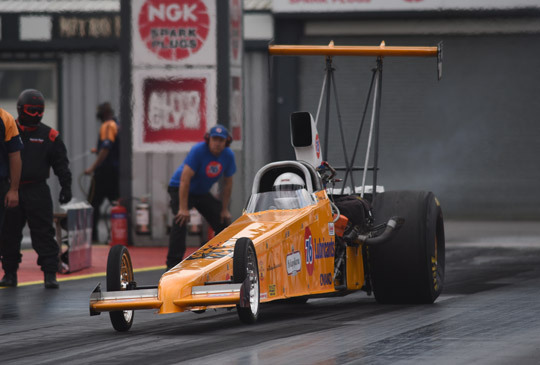 In Top Methanol Dragster Jonny Lagg already clinched the 2016 title in qualifying. The final was won by Dennis Habermann. 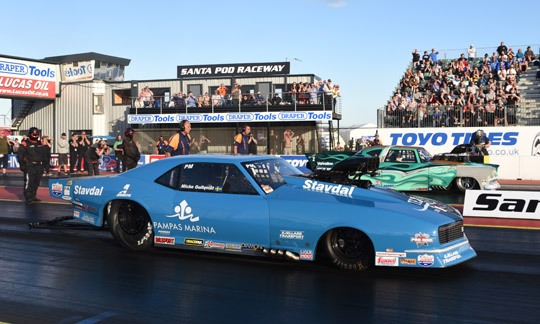 In Top Methanol Funny Car Johnny Oksa from Finland was crowned as the new champion in the penultimate race of the season in Sweden. 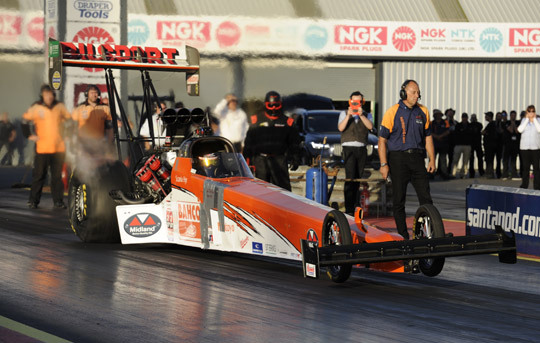 The European Finals at Santa Pod Raceway was the sixth and final round of the 2016 FIA European Drag Racing Championship. Sunday eliminations were held under perfect sunny conditions, and so the ten thousands of spectators were offered an action packed and exciting race day. 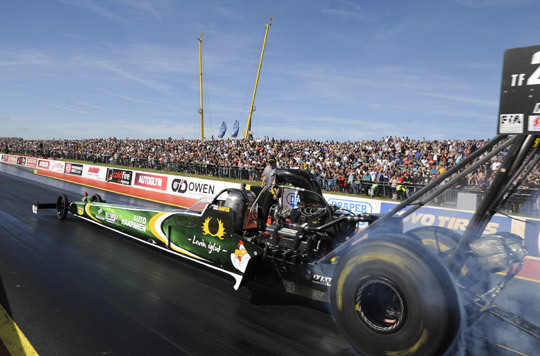 In Top Fuel the championship was decided in the semi-finals. Championship leader Anita Mäkelä was defeated in the semi-final by Duncan Micallef. The number eight qualifier surprised in the first round with a stunning 3.89 seconds to storm to another 3.89 seconds at 312 mph in the semi-final against the Finnish championship leader. For the second consecutive year it looked like Mäkelä would lose the title in the last race of the season. In the second semi-final Stig Neergaard, the number two in the championship, had to defeat Michael Kågered to gain the 20 points he needed to clinch the title. But the Dane was defeated by Kågered and so the title went to Mäkelä. As Micallef suffered severe engine damage in the semi-final, the Maltese driver couldn’t start in the final and the last race of the season was won by Kågered. The Swede ended the championship behind Mäkelä and Neergaard in third position. In Pro Modified the championship was also decided in the semi-final in a race between the numbers one and two in the championship, Michael Gullqvist and Bruno Bader. Gullqvist was the leader before the European Finals, the number one qualifier and with 5.89 seconds the Swede also recorded the best elapsed time in the quarter finals. In a close run Gullqvist once again broke the 6-second barrier with 5.90 seconds to defeat Bader and clinch the 2016 FIA European Pro Modified title. In the final Gullqvist had to face Mats Eriksson as the Swede advanced to the final with low 6.0-second runs. Gullqvist was also in a class of his own in the final as the just crowned champion recorded 5.88 seconds to take the win. Eriksson ended the championship in second position and Bader dropped to third. 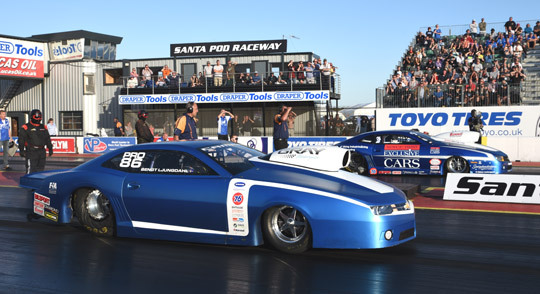 In Pro Stock the championship was also decided in the semi-finals. Championship leader Jimmy Ålund had to face Stefan Ernryd in the semi-final. 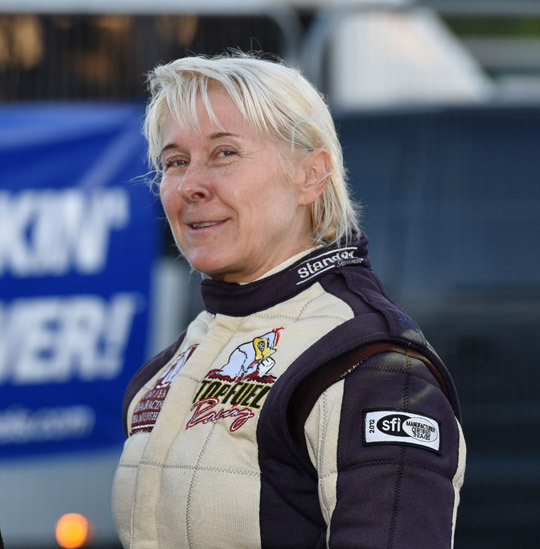 Ålund defeated the rookie Pro Stock driver (who pulled a red light) with 6.55 seconds. Even a win in the semi-finals couldn’t help Bengt Ljungdahl as Ålund had enough points to clinch his tenth FIA European Pro Stock title. Ljungdahl won his semi-final and showed his great form by defeating the just crowned champion in 6.53 seconds to take the race win. 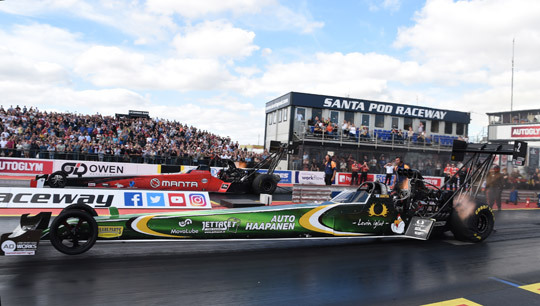 In Top Methanol Dragster Jonny Lagg from Sweden only had to qualify at Santa Pod to win his first ever FIA European Top Methanol Dragster title. The Swede did what he had to do with the number three qualifying position. The new crowned champion was defeated in the quarter finals by Dave Wilson. Dennis Habermann, the 2015 champion, defeated the British home favourite in the semi-final and so the final was a Habermann family affair with Dennis defeating his brother Timo to take the win. 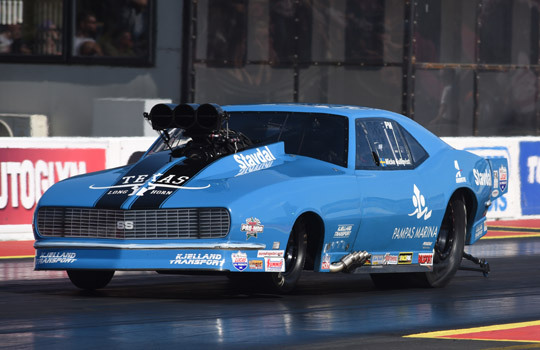 Top Methanol Funny Car was not contested at the European Finals. With three wins Johnny Oksa secured the title in the penultimate race of the season at Tierp Arena in Sweden.